Ohev Shalom has a rich history of quality theatrical productions. 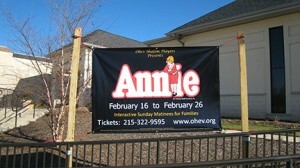 Under the direction of Michael Schwartz the Ohev Shalom Players produce Broadway musicals every other year. The casts of these productions are exclusive to members of the congregation and are presented to the community at large. This group is a fine example of a true Havurah that has been established within the Ohev Shalom Community. Although we work really hard, we have so much fun!